MENDOZA, Argentina -- THE awesome crags of the Andes glitter like icebergs in the early morning sunlight as the plane lets down here in western Argentina, across the grassy Pampas from Buenos Aires. 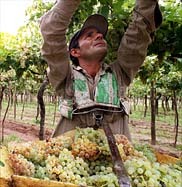 The vineyards near Mendoza in western Argentina yield grapes that make the country one of the world's largest producers. Runoff from the melting Andes snows, diverted into canals built by the Tehuelche Indians as early as the 16th century and improved by the Incas and the Spanish, makes Mendoza bloom. Although located at the edge of the Cuyo desert, this is a city of plane trees and sycamores, shady parks and broad plazas, fountains and rose gardens. That same water nourishes the vineyards surrounding the city. Mendoza wines have helped to make Argentina the world's fifth-largest producer, a reliable source of inexpensive red for the country's thirsty population, much of which traces its origins to Italy. But until recently they have never counted for much in world markets. Dr. Nicolás Catena is changing things; not single-handedly, exactly, any more than Michael Jordan single- handedly won pro basketball championships for the Chicago Bulls. 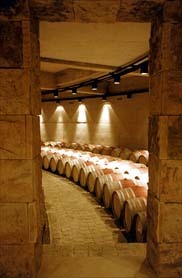 But he has shown customers in North America, as well as friendly rivals here, what Mendoza can do at every price level. At 61, slight, soft-spoken and studious-looking in rimless glasses, he is the acknowledged star, the pacemaker, the public face of the Argentine wine industry. It is an industry in rapid ascendancy. More first-class wines appear with each vintage, and critics and consumers around the world have taken notice. On the shelves of shops in the United States, labels like Balbi, Flichman, Norton, Santa Ana and Terrazas have won space, along with Catena, of course. Despite the country's debilitating economic troubles recently, foreign millions continue to pour in to finance new vineyards and wineries. Beginning with Dr. Catena's grandfather in 1902, the Catena family established a local reputation for red wines. These wines, made largely from the criolla grape, were too sweet and too often oxidized. "We never imagined," Dr. Catena said, that "anyone here could compete with the Europeans — perhaps 10 percent as good, no more." Dr. Catena's great awakening came when he went to the United States. Already armed with a Ph.D., he studied economics and mathematics at Columbia University during the turbulent late 1960's and then, in 1982, found himself at Berkeley as a visiting professor. Inevitably, he visited the Napa Valley. Almost as inevitably, he fell under the spell of Robert Mondavi, whose winery was at that time helping to establish lofty new standards for American wines. "I discovered what investment, research and enthusiasm could achieve," Dr. Catena told me and my wife, Betsey, over a candle-lit dinner under the maple trees at 1884, the restaurant that he has set up in his century-old Bodega Escorihuela. "I saw that the Americans had done in 10 years what the Europeans took over 300 years to do. "I decided that I had to do something similar. I thought we needed to make cabernet and chardonnay, even though we didn't use those grapes much in Argentina at the time. They were the best, obviously, and I wanted them." After a time, Dr. Catena got to know the peripatetic Mr. Mondavi, and they discovered that their families had come from the same part of Italy — the Marche, on the Adriatic coast. TOP Catena cabernets and chardonnays have been exported to the United States for a decade now, and they have received enthusiastic notices from the world's wine critics — easily the equal of the reviews accorded to the much better-known vintages of Argentina's neighbor to the west, Chile. Unlike some Chilean producers, Dr. Catena has been careful not to price himself out of the North American market. The number of wine drinkers in New York or Los Angeles willing to pay $50 a bottle and more for his top-of-the-line Zapata reds may be limited, but for those who are not, there are Catena wines at more modest prices, sold under Catena Alta, Catena and Alamos Ridge labels. "In the end," said my English friend Bill Baker, one of his country's most respected wine merchants, "Argentine wines will be better and better priced than their Chilean competitors." I tasted Catena Alta cabernets, merlots and malbecs from 1997 and 1999 with Dr. Catena, and they were only slightly less aristocratic than their Zapata counterparts, which had not yet been released. They had just as much fruit, just as much robustness of flavor, perhaps a little less opulence and complexity. The Alamos Ridge wines, tasted in the United States, made a less vivid impression, of course, but they struck me as good values at around $10 a bottle. The Argentine wines that interest me most are the ones made almost nowhere else, including the chunky, chewy, spicy malbec among the reds and the tangy torrontés among the whites. Malbec, which is also called Auxerrois by the French, was once an important grape in Bordeaux, used extensively in the days before the great phylloxera epidemic of the 19th century in wines like Chateau Latour. Now it is used only in Cahors in southwestern France, where it traditionally produced heavy, intensely tannic wines, almost black in color, which were often not ready to drink until they had spent two decades in the bottle. Modern Cahors is a bit gentler. Argentine malbec is different. The deep violet glints in the glass are similar, as are the jammy flavors of ripe berries. But where the tannins in Cahors can be quite harsh, those in the best Argentine malbecs are sweet and silky, and the wines give no impression of heaviness at all despite their power. They make perfect companions to Argentina's great beef or to our own. In 1960, Argentina had 120,000 acres of malbec, but then came the stampede to "international" grape varieties like cabernet. Now there are only 25,000 acres left, but the best of those vines, including several owned by Catena and by the Austrian-controlled Bodegas Norton, are 70 to 100 years old. At the moment, Pedro Marchevsky, the Catena vineyard manager, is conducting experiments with 135 malbec clones in the company's Tikal vineyard. The torrontés vineyards are some of the world's highest, many more than a mile up, near the village of Cafayate in the northwestern corner of the country, not far from the Bolivian border. No movie theater or bright lights there, "just work," laughed Susana Balbo, a highly regarded Argentine winemaker who toiled for a time in Cafayate. Two of the best examples are made by Etchart and Michel Torino, both reminiscent of albariño and viognier in their jasmine-scented bouquets and fresh tropical-fruit flavors (mango? pineapple?). Another, only slightly less appealing torrontés, easier to find in the United States and irresistibly priced at about $7, is made by Santa Julia. AT the moment, the light of Dr. Catena's life is a striking new winery near here, built of cream-colored local stone and pale, indigenous hardwoods in the shape of a Mayan pyramid. It opened earlier this year. His daughter Laura Catena, the company's export director, a Harvard- and Stanford-educated physician who somehow combines the practice of medicine in San Francisco with her work in the wine trade in Argentina, commented recently that the $12 million building "shows our pride in our own culture." So does 1884, the Catena restaurant. The family recruited Argentina's premier chef, Francis Mallmann, to create a menu that celebrates the Incan influence in the region, with dishes incorporating corn and pumpkin, as well as the beef of the Pampas — not to mention, of course, the wines of Mendoza. Much of the cooking is done in the courtyard in traditional igloo-shaped mud ovens, or hornos. We sampled bitter, palate-cleansing chicory, seared at 600 degrees, with almonds and sun-dried tomatoes; empanadas made the old-fashioned way with hand-chopped instead of ground beef; a tart of onions and leeks, and magnificently juicy goat, scented with lemon and oregano, roasted in an iron box — all the while talking politics, monetary policy, Machiavelli and wine prices with Nicolás Catena. On the latter subject, he said, "I have known from the start that if I charged $40 a bottle, the wine had to be comparable with a French wine selling for $60 or $80, because people are not used to costly wines from here." And he acknowledged that like Mr. Mondavi and his Italian friend Piero Antinori, he makes far more money on his cheaper wines than on his prestige products. But he pours his passion into the top of the line. He has raised the quality bar in Argentina by limiting production through the pioneering use of controlled irrigation and by rigorous thinning of his grapes. He has planted vineyards at altitudes as high as 4,900 feet, which provide the cooler temperatures and lower humidity that help to produce premium grapes. He has imported French barrels and computerized European winemaking gear, installing them in immaculate wineries that contrast starkly with the unhygienic facilities and poor barrels that plagued wine production in Argentina for decades. Others have joined him here in the pursuit of modern excellence. Hiram Walker, Moët & Chandon, Pernod Ricard, Kendall-Jackson, Allied Domecq, Sogrape of Portugal and several Chilean companies have made huge investments. Exports have grown to about $140 million from $40 million in the last five years. Norton, which was founded in 1895 by a British engineer who had worked on the railway across the Andes, now belongs to the family that controls Swarovski crystal. Carlos Tizio Mayer, the technical manager, described its strategy: to keep prices down — no more than $15 for the top blend, marketed as Norton Privada — "so we can earn a little money and a lot of customer loyalty." "It's easy to produce very expensive wine here, but it's not so easy to produce good value," he told us as we toured the winery, which is surrounded by spectacular rose gardens. "We want to make our name and attract our customers now, because in the next few years only three or four Argentine names will loom large in the international market, and we intend to be one of them." I was taken with Norton's 2000 sauvignon blanc, a crisp yet fruity wine with just the right sharpness, but there, too, it was the malbec that turned my head. The 1999 exhibited had a nose like a magnet that drew you right into the glass, and a typical big-shouldered, almost rowdy style on the palate. Never contaminated by phylloxera, the Argentine malbec, as Mr. Tizio said, "is a natural treasure in its genetic purity." It can make great wine.